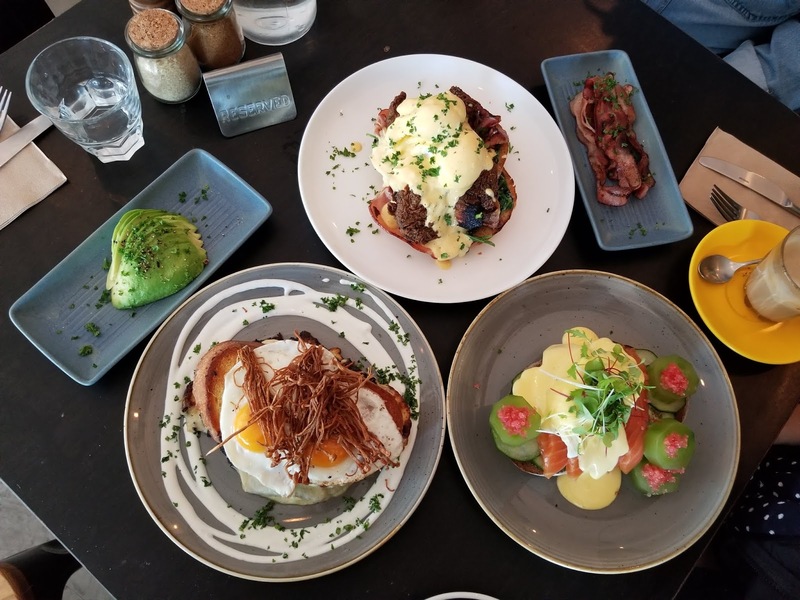 With the cool winter setting in, there is nothing better to start off a weekend than with a hearty brunch to warm us up before our busy schedules kick in. 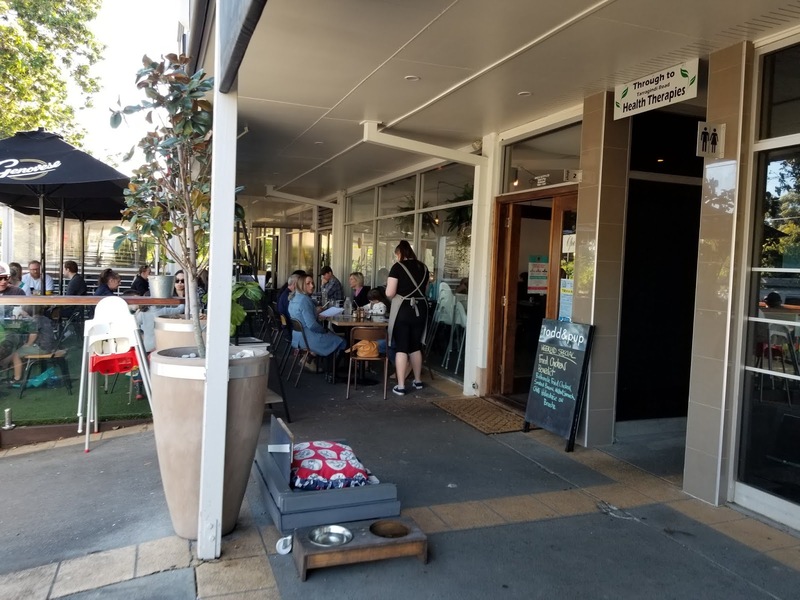 Having heard and seen much online about the recently renovated Todd and Pup, I was quite pleased to receive an invitation from the owner, Kate, to try out some of their brunch offerings. 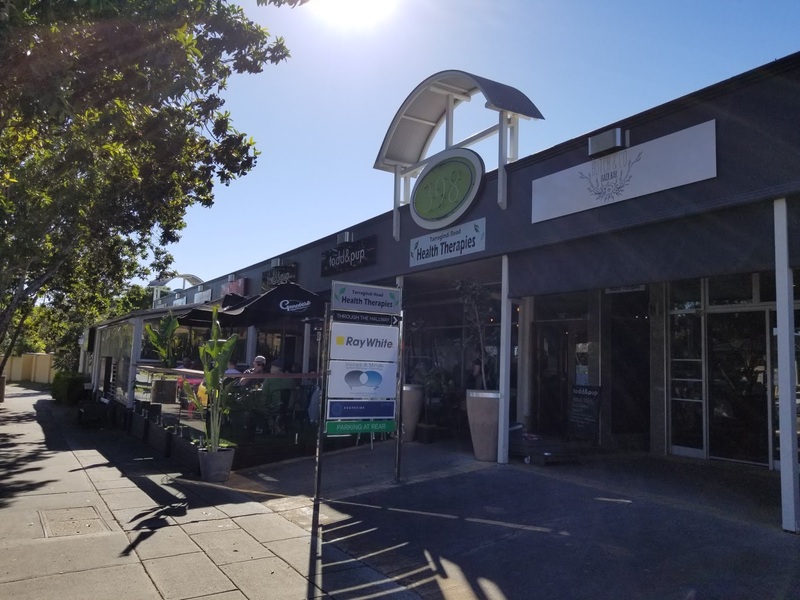 Taking a quick drive to the bustling shopping strip on Tarragindi Road, I was quite happy to secure the final inside table which had been reserved for us that morning. 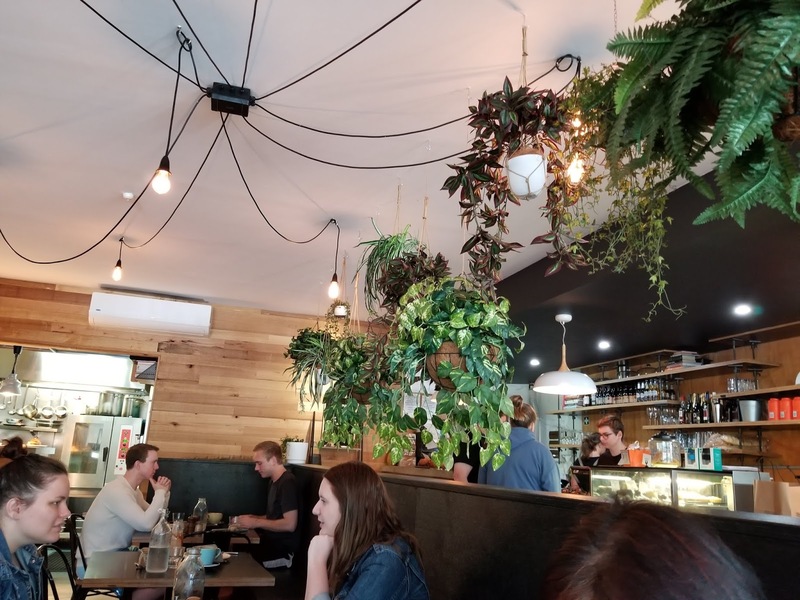 I really enjoyed the cozy relaxed atmosphere of the cafe, especially with the hanging plants, which brought a bit of nature indoors. 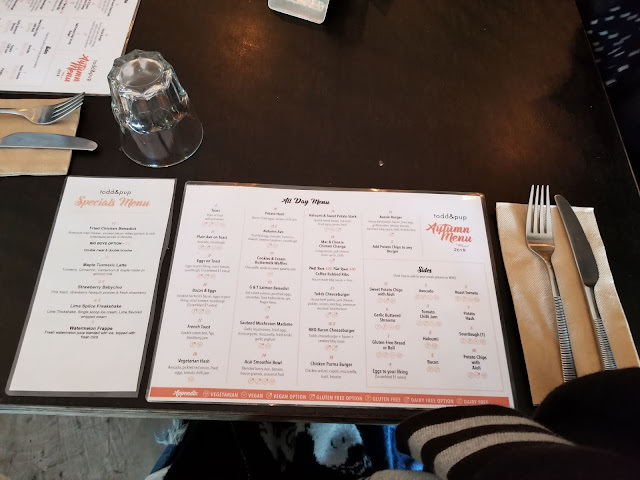 There was an all day brunch-y menu, which also comprised of not only breakfast options, but also more substantial things like ribs and burgers. My companions, ever decisive, made their minds up very quickly and we gave our order to our friendly waitress promptly. Our coffees arrived very promptly afterwards. 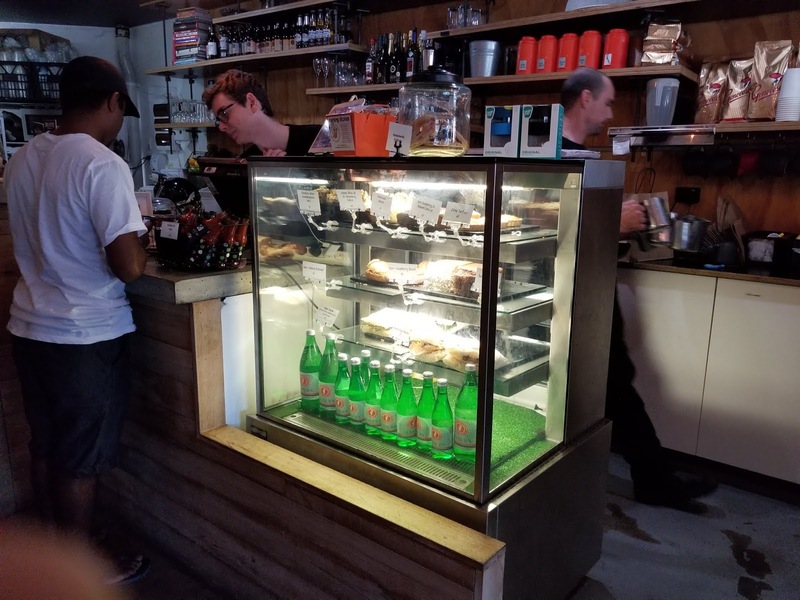 Both companions ordered lattes in a cup. I had a cappuccino in a bowl. 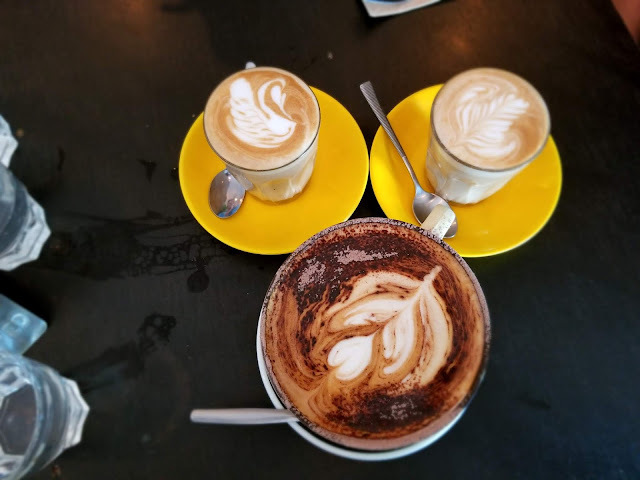 All three coffees were well received. They had a strong fragrance, a full body and weren't overly acidic. 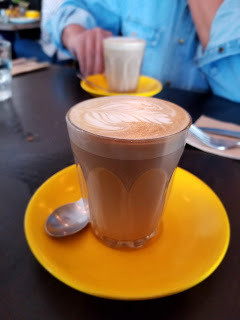 I liked the creamy milk and the fairly strong caffeine hit. 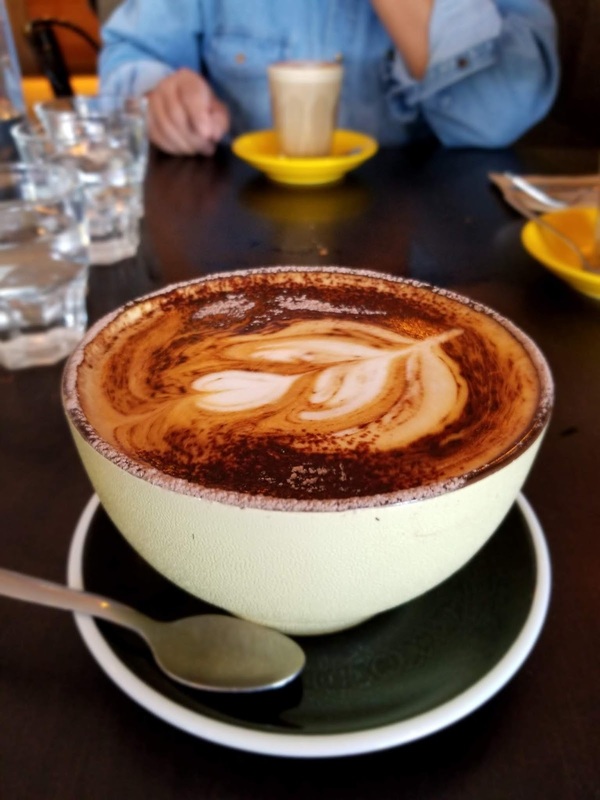 I was particularly impressed with the size of my cappuccino in a bowl, which was easily double the size of my companions drinks. Whilst our drinks were fast, our food took a little while longer to come out. Without a doubt this is because the cafe was unbelievably busy in the morning. I was lucky to get a seat with a good view of the kitchen, so I could spy on all the delicious food as it came out. After around 20 mins or so, our food arrived, and it was definitely a sight to behold. My first companion had the G & T salmon benedict. 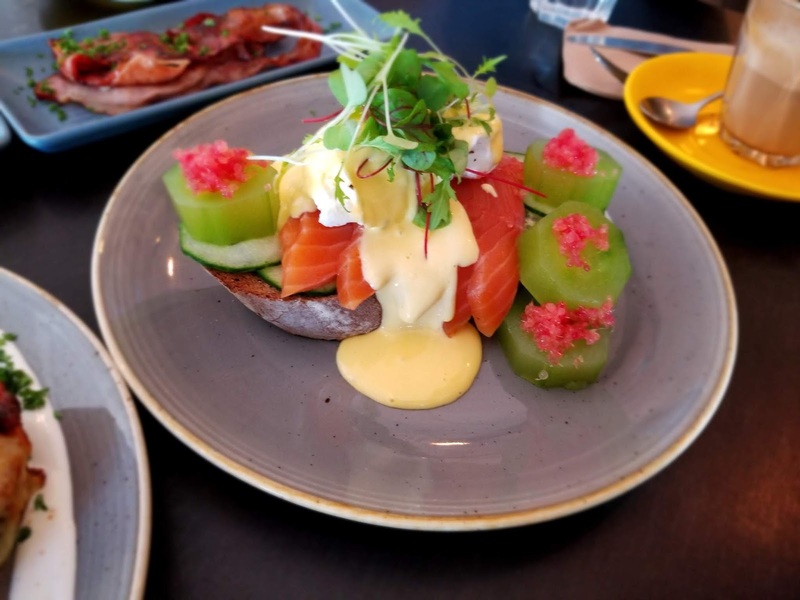 Consisting of gin cured salmon, poached eggs, cucumber, lime hollondaise, rye and finger limes, it made for a wonderfully colourful and aesthetically pleasing meal that captured a lot of glances from our neighbours as it came out from the kitchen. 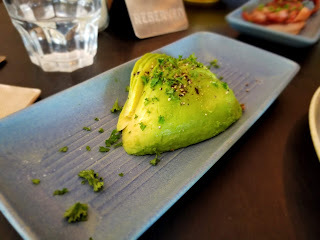 The dish itself was very fruity, with pieces of crunchy cucumber topped with a wonderuful citrus-y garnish, it made for a really light tangy zesty start to my companions meal. The cured salmon was also delightful with light delicate gin flavours atop the toasty rye. She only wishes that there were some bolder flavours to really contrast the softer flavours. 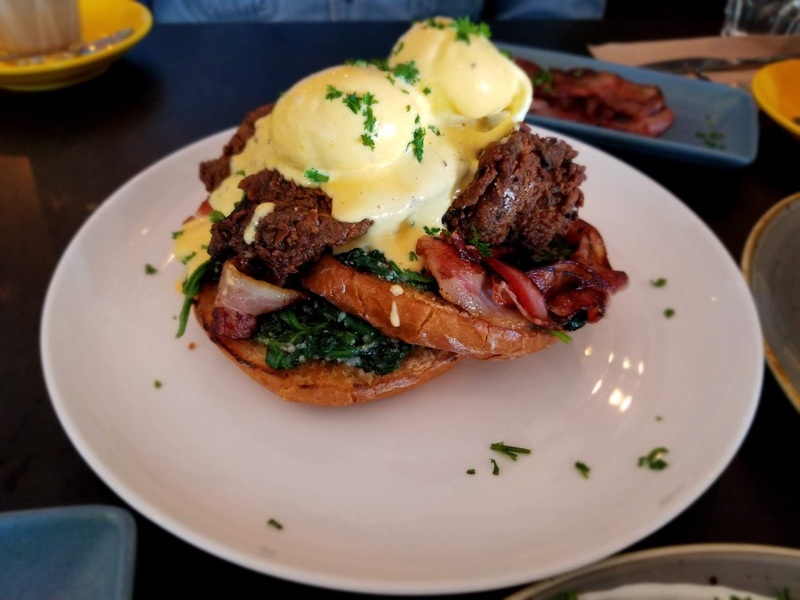 My other companion ordered the fried chicken benedict, which consisted of buttermilk fried chicken, smoked bacon, wilted spinach and chilli hollondaise served on a brioche bun (this was the double meat double brioche option). Compared to the salmon benedict, my companion was amazed at the strong flavours in the dish. The chicken was wonderfully seasoned, with a crispy batter and tender juicy insides. 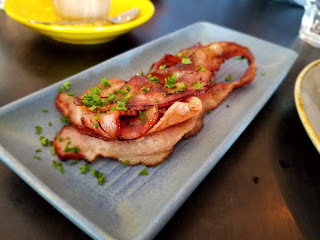 The bacon was really smoky and the spinach had a delightful garlicy taste to it. 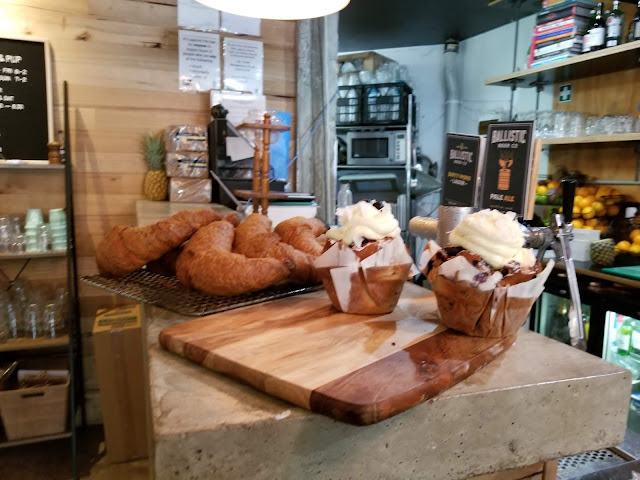 The bread was fluffy and soft too, and the eggs were done just right. The only improvement my companion could suggest was that the chicken was more on the burnt side and could have been a bit less toasted. 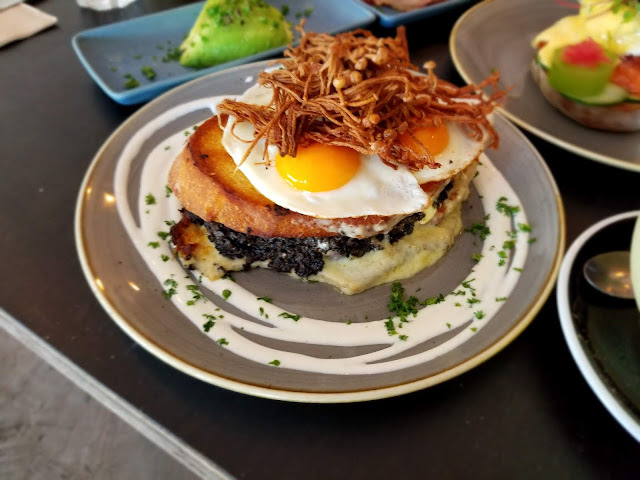 Having done considerable research before arriving, I opted for the sauteed mushroom madame, with garlic mushrooms, fried eggs, mascarpone, mozzarella, fried enoki with garlic yoghurt. Despite the fact that it was a vegetarian dish, and I am a self professed meat lover, it was an amazing dish. The garlic and mushroom puree sandwiched between the two pieces of sourdough were wonderfully fragrant with a strong truffle-y aroma. 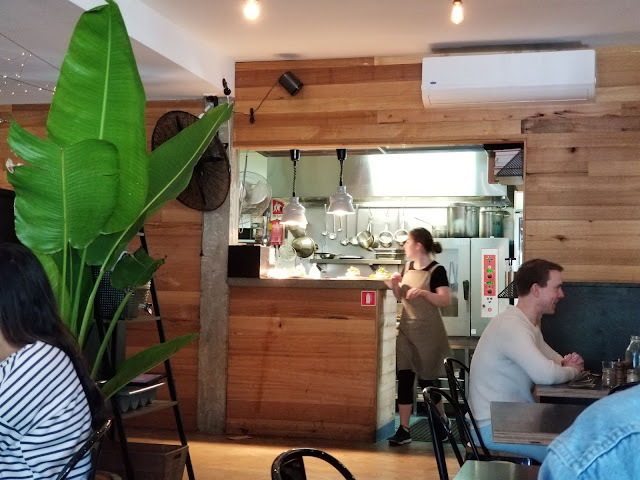 The fried enoki was definitely a highlight, with a crispy exterior and slightly chewy interior, which went very well with the garlic yoghurt. The eggs were also fried well, but I would have liked a crispy edge around the whites. To share, we also had two sides, avocado and bacon. The avocado was delightfully ripe, and the bacon was nice and crispy, and I really appreciated that it didn't have too much fat on it. They both made for wonderful compliments to our meals. Espresso and Matcha were invited guests of Todd and Pup, but as always, our opinions are solely our own.